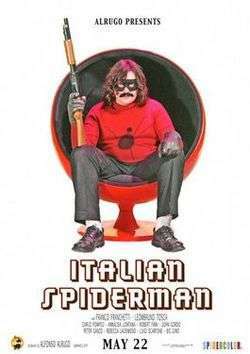 Italian Spiderman is an Australian film parody of Italian action–adventure films of the 1960s and 1970s, first released on YouTube in 2007. The parody purports to be a "lost Italian film" by Alrugo Entertainment, an Australian film-making collective formed by Dario Russo, Tait Wilson, David Ashby, Will Spartalis and Boris Repasky. Ostensibly an Italian take on the comic book superhero Spider-Man, the film is a reference to foreign movies that misappropriate popular American superheroes such as the Turkish film "3 Dev Adam", and licensed series such as the Japanese TV series "Spider-Man", both of which alter the character of Spider-Man for foreign audiences. Other notable entries include the Indian version of Superman (1987), The Three Fantastic Supermen (1967) and La Mujer Murcielago (The Batwoman) (1968). It also resembles the movie Bathman dal pianeta Eros (1982). A trailer was released, followed by a full-length feature made up of ten mini-episodes. In the middle of a party, an asteroid from a distant galaxy falls to Earth and is taken by professor Bernardi (Carmine Russo) for research. He discovers the asteroid has a substance that can create duplicates from any living being and decides that Italian Spiderman (Franco Franchetti), a fat, rude, chain-smoking, and powerful superhero, is the only man capable of holding custody of the valuable asteroid. As soon as Professor Bernardi gives Italian Spiderman the asteroid, he is attacked by the terrible Captain Maximum (Leombruno Tosca) who is interested in using the asteroid for his own evil plans. Foiled in his attempt to steal the asteroid from Bernardi, he transforms the Professor into a snake. Captain Maximum later intercepts the Italian Spiderman and takes the asteroid, although he gives Italian Spiderman a chance to win it by beating Maximum in a surf contest. When Captain Maximum notices the obviously superior surfing skills of Italian Spiderman, Maximum attempts to win by cheating. His efforts fail, however, as Italian Spiderman summons the help of penguins (which hurl themselves at Captain Maximum and his henchwomen) and wins. When Italian Spiderman returns home, he is again attacked by Captain Maximum's henchmen, where a tranquiliser dart causes the hero to collapse. Waking up in Captain Maximum's lair he witnesses how the professor is forced to use the powers of duplication on one of Captain Maximum's henchmen. Italian Spiderman is forced to watch as the professor is shot by Maximum. The furious Italian Spiderman attacks Maximum's henchmen, killing many in a surprisingly gory battle sequence. Despite Italian Spiderman's efforts the Professor dies but in his last moments gives the Italian Spiderman the potion. Italian Spiderman again attacks the headquarters of Captain Maximum. Despite having the potion, Italian Spiderman overwhelms by his powers alone the newfound army (showing in the process to have a venomous bite and removable moustaches that can double as razor-sharp boomerangs). Later, Italian Spiderman returns home with the Professor's niece. When a gigantic Captain Maximum lays siege to the city, Italian Spiderman finally drinks the potion, growing to the same height of Captain Maximum and battling him until the titles roll. The project began as a trailer for a non-existent film, produced as a student film at Flinders University by director Dario Russo for his final year Screen Production project. The "trailer" was shot, over the course of one day, on 16 mm film using an older style camera to achieve an authentic look for the films of that era. Publicized as an actual lost Italian action film from the late 1960s, the film was later uploaded onto YouTube on 8 November 2007 where it has gained a massive cult following with 4,680,442 hits as of 29 March 2013. With some of mainstream media taking interest in the film, this led to the South Australian Film Corporation giving the filmmakers funding for ten more short films. The first installment of the "feature film" premiered across the Internet on 22 May 2008; further instalments followed on a weekly basis. The series was well-received, but ended on a cliffhanger. The May 2010 announcement of the end of Alrugo Entertainment cast doubt on the possible continuation of the project. On 24 October 2011, a video announcement was made declaring the end of the Italian Spiderman project and the formation of a new production company between Dario Russo and David Ashby, called Dinosaur. The same video also officially announced the duo's television show, Danger 5. Soulful Torino Records: Here comes the Italian Spiderman!